My sister-in-law and I share some things in common: mental illness and suicide ideation and attempts. Not a great club to join but she has a tattoo with a ; on her wrist that I asked her about. She said it was to remind her that her story isn’t over yet and there is more to be written. An author uses a ; to add an additional thought to a sentence without closing or ending the sentence with a . first. For example, I’m thinking of ending my life; but I have too much going on tomorrow! My life’s not over yet. Well, my twenty-something sister-in-law has a tattoo but my ever loving wife noticed I wanted one but being in my fifties not very keen on getting an ink job. 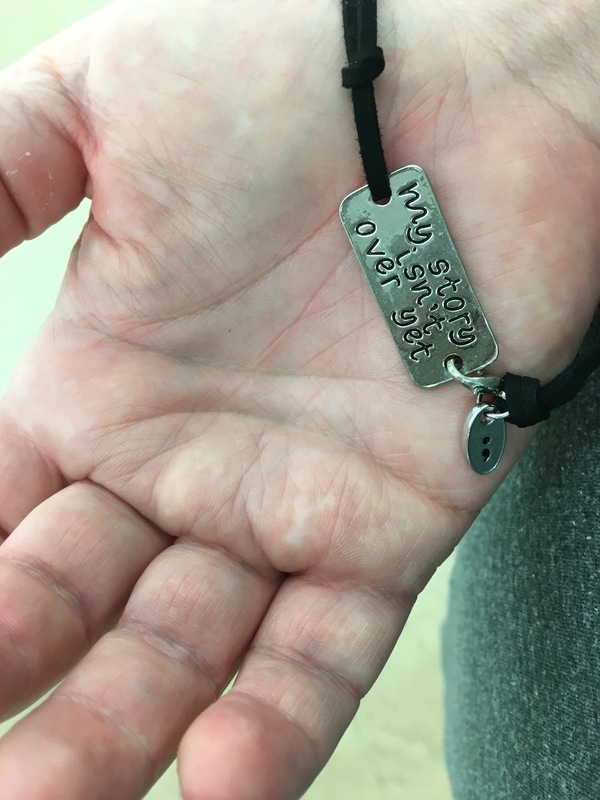 My wife got me the bracelet shown in this post which reminds me every moment – there are people who want me to live, including me. I am a survivor. I’ve survived before and I’m not going to risk surviving again but if I do attempt, I’ll probably survive because I don’t want to really die. If I do it’s because of a manic, poor judgment, poor impulse controlled reflex most likely where I don’t even think about it. Something I’m not accountable for for sure. But I am not going to do it. I have a ; on my wrist and it speaks to my commitment to keep the life going! Keep the story going. Thanks, honey, for finding this gift!